Bob the builder! 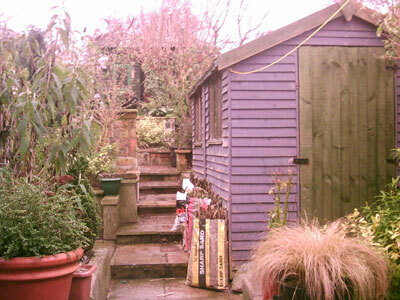 Since moving to our present house back in 1998 Bob worked in this cramped 7x9ft shed. Working in there became almost impossible for Bob when we started Olleys Armies, because now he had to share his sculpting space with stock and a computer. 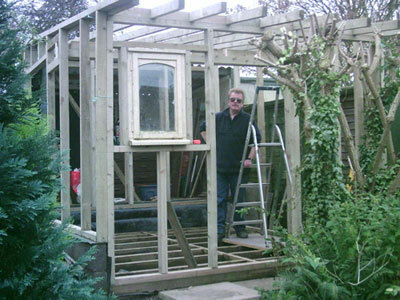 So in 2004 Bob built his own tailor made shed, with areas for sculting, packing orders, stock storage and painting. 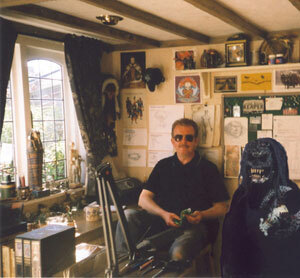 Click on the images and take a tour of Bobs new studio. Olleys Armies was set up in october 2003 by Bob Olley and myself, Jackie. Bob does the sculpting and artwork, and I do the website, our moulds and castings are made by Pete Brown and most recently by Griffin Moulds. Bob has been a freelance sculptor for 20 years and was a historical figurine painter before that. He first became interested in sculpting miniatures when he saw some of Citadel's fantasy miniatures. Back then green stuff was unknown to us, so Bob's first sculpts were in fimo, unfortunately they melted during the moulding process. Not a good start, but determination and a packet of newly discovered greenstuff won through. Then sometime around the end of 2002 we had the mad idea to do it for ourselves, I can't remember which of us had the idea and neither of us will own up now. Anyway, Bob started making the first minis and I bought a computer, learnt what a mouse was and how to write a website. We called our company Olleys Armies because it ryhmes quite well and we hoped Bob's name might be recognised by collectors, in October 2003 the website went online. Olleys Armies is still only a part-time business for us, but despite the costs involved for moulds etc. and the limited time available due to Bob's other freelance design work, the number of miniatures continues to grow. Lastly, the unexpected bonus of the Olleys Armies website is that after all the years that Bob has been sculpting, he now gets to hear directly from the people who collect his miniatures, so thanks to everyone who's got in touch.